Of all the books about cricket, Mike Harfield's "Not Dark Yet" brings a rare authenticity to the subject. This is a book by a genuine cricketer and a genuine cricket fan with a talent for capturing the spirit of this special game in his witty prose. David Lloyd, aka Bumble, laughed so much he agreed to write the Foreword. He even showed the book to Christopher Martin-Jenkins who found it 'very entertaining and enjoyable'. Reading the book raises the spirits with its cheerful jollity. The mixture of banter and eclectic cricketing information carries the reader along, making for both easy and captivating reading. 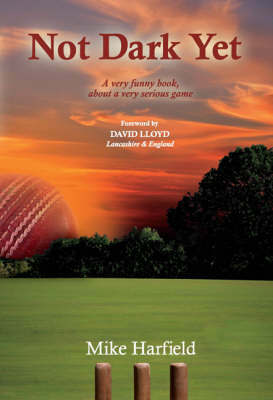 Loosely based around Mike Harfield's captaincy of a cricket XI over 30 years, Not Dark Yet is both the humorous story of his team's efforts and his often irreverent take on first-class and international cricket. For 30 years the Mike Harfield XI has withstood atrocious umpiring, dreadful hangovers, bad haircuts and a woeful lack of talent, only to encounter an even greater adversity - middle age. Spiced with humour and plenty of banter about fellow team-mates and international players alike, their captain's tales convey an authentic picture of one team's endeavours, to which cricketers and non cricketers will easily relate.